The Argos eGift Card is the perfect way to get your hands on shiny new stuff. Fast. Delivered to you by email, you can spend your eGift Card online at argos.co.uk. Letting you shop from your sofa. Or the pub. Or anywhere you like really. We don’t mind. Or you can use it in any of our 840 stores. Perfect if you fancy a bit of fresh air and a stroll. Either way, just enjoy spending it. With over 50,000 products to choose from at Argos, you’ve got some decisions to make. We have all the latest must have items. From tech to toys, furniture to jewellery, there’s bound to be a great gift for you. Want it today? With Argos Fast Track Delivery available on many items, Argos can deliver to your door the same day! Just check for the Fast Track badge on your selected product at argos.co.uk. Select Argos eGift Card. Go Argos. Simply visit argos.co.uk and add your selected item(s) to the online basket. Proceed through to checkout, select your chosen method of delivery/collection and then input your eGift Card and PIN as payment. You can use the eGift Card as full or part payment, but please note only three eGift Cards can be used per transaction. 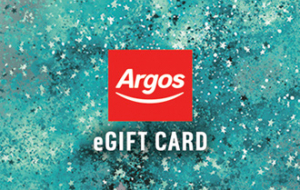 eGift Cards may be redeemed in full or part payment for goods in-store or online at argos.co.uk from the Argos range, including current promotional offers, at the prevailing prices listed. eGift Cards cannot be used for the purchase of other gift cards or vouchers. GBP £ eGift Cards cannot be redeemed in ROI. This eGift Card is not a credit, payment or cheque guarantee card, cannot be redeemed for cash or returned under the Argos 30 Day Guarantee and cannot be sold. This will not affect your statutory rights. Argos Ltd reserve the right to decline or withdraw the eGift Card at any time. Argos Ltd cannot be held liable for lost, stolen or damaged eGift Cards. If you have any queries just give us a call us on 0345 606 0970.